The first problem is coming when we find the newsstand where we usually get our train tickets is closed. Asking some people in the street is not helping as they don’t know where to get tickets. We even look after the way of reaching the metro station by walking but we cannot find a way to do that. A taxi driver asks about our situation when he can see we’re kind of lost and when we explain our problem to him he answers surprised: “Don’t pay”. We finally do that after checking the stations and platforms and confirming there is no way of getting tickets here. It seems people are used of traveling with no ticket here. This way, we go out from “Colosseo” metro station some minutes past 11 AM, after a short line switch in “Termini” to the blue line. The first thing we can see is the huge wall of the Colosseum itself across the road, but we’re going to visit it later. So we take the opposite direction to go up the stairs and walk just a couple of blocks away to the Church of Saint Peter in Chains (San Pietro in Vinculi), which was built to keep the relic of the chains used against Saint Peter, but is famous because it has the statue of Moses by Michelangelo. If there are a lot of souvenir stalls in front of the Colosseum with replicas of the monument as main product, in different sizes, in this Square di San Pietro in Vinculi there is only one, but a lot cheaper than those. What we find inside is a basilica with art everywhere. The apse is showing a golden reliquary containing the chains which are giving sense to the whole temple. Just in front they’ve set a nativity scene. All this is limited by four columns sustaining a canopy . There are paintings all over the walls and some marble sculptures in the right side of the aisle, but nobody is paying attention to them as they have Michelangelo’s Moses just in front, as part of a larger group. We’re coming back to the Colosseum, taking some pictures of the great views of it from this upper level. We’re going to give the first use to the Roma Pass here. We can save the line with it, although in a winter day like this it is not too long, and access inside the monument. It’s 11:45 AM when we’re walking along the pass ways which connects to all the exits to the all levels of tier, like in our modern stadiums. We explore all levels looking after the different views of the interior of this huge building for shows. In our days is not difficult to see tens of thousands of people watching an event, but this Colosseum really got full 1900 years ago? Today it appears as “naked”. The seats are no longer here and neither the pit floor, we can see the bowels under it instead, which is the area known as hypogeum. As we go higher the views are improved. The temple of Venus and Rome and the Arch of Constantine are two good examples of it. It’s 12:20 PM when we leave the men dressed as Roman centurions looking for some cash in exchange of photos, the Colosseum and Arch of Constantine behind and walk to Palatine Hill, where we’re going to go on with our visits. Access ticket to Colosseum includes Palatine and Roman Forum, so these are the next places to explore. There is also a small museum about the first Etruscan settlement by Romulus and Rome, which was the source of the city of Rome, which seems it happened here too. The itinerary through Palatine must address you to the Roman Forum, which is clearly delimited by two arches. We access through Arch of Titus and leave through Arch of Septimius Severus. Apart from these two arches, there is nothing else completed, but these are the remains of the city center of the ancient Rome, the street with more live. 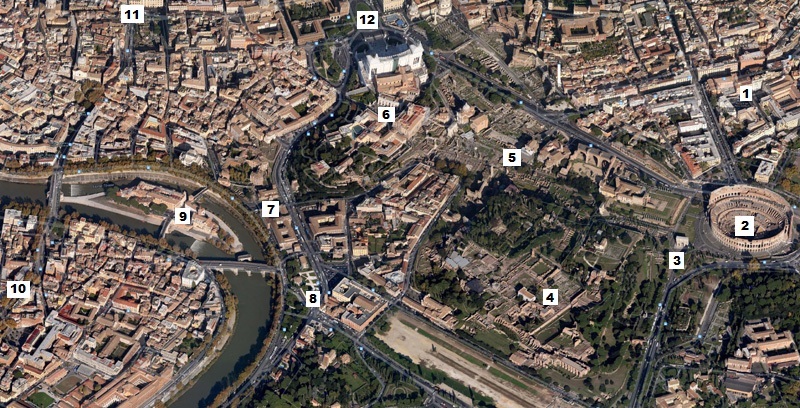 We can find the ruins of Rostra, temple of Vesta, or Curia Hostilia, just mentioning a few examples. The Temple of Vesta is a small circle and is hard to imagine here was the place where the girls who delivered their lives to keep the fire honoring this goddess alive, the vestal virgins, were the source of the arousal of the most of the Rome citizens. Easier is seeing Cicero leaving the Curia, after a hard session in the Senate and make one of his philippics, as a speech to the people against Mark Antony, in the Rostra. Back to the present we find the Square of Campidoglio, just leaving the forum to the summit of the Capitoline Hill, surrounded by the Capitoline museums. But we’re not going to go into them; instead, we walk down Via del Teatro di Marcelo to find what the names is pointing to: The theater of Marcellus, where Augustus watched the plays of Horatius. Well, what remains from it, though, is just some 45º of its circled façade, which is now integrated to residential buildings. We keep walking down to Piazza Bocca della Veritá (Mouth of Truth Square), where we expect to visit what it is giving name to the place. On this square we can see a small circled temple, a fountain and the Church of Saint Mary in Cosmedin with its beautiful bell tower. We go to the church looking for a sign pointing to the location of the famous Mouth of Truth, but the sign results to be a line of tourists waiting their turn for the picture with the face carved in this sort of big stone coin. The line, just in the entrance to the church, is fast. So you take your picture and get into the building, where meet a more modest interior than the rest of churches we’ve visited in Rome. We go back up this time, without missing the river side. It’s 2 PM and we’re hungry, so we only have to go across the river to choose a restaurant in Trastevere. We already wanted to lunch on this neighborhood, which starts just on the opposite river side. We cross the river through the Tiber Island, which we reach from Fabricio’s Bridge. We take a look to the Basilica of St. Bartholomew on the Island, which gives its name to the square where it is sited. We leave the island through Cestio’s Bridge, getting into the colorful and narrow streets of Trastevere, where we can find quickly a place to lunch. The pizza in restaurant Vincenzo all Lungaretta is delicious, although Eva prefers a two dishes meal, with the drinks we round the tip to a total of 30€. We took our time resting here and it’s 3:30 PM when we’re back walking through these streets in our way to the Church of Saint Mary in Trastevere, the most relevant place here. When we reach it, there is a funeral going on in the church, so we just take some photos from the entrance discretely quite embarrassed. So this way we’ve finished our long list of visits for today. We walk back to Via de Trastevere which seems to be a hub for the public transport and get the tram to cross the river back and leave it in a place called “Largo di Torre Argentina”, a big square with some ruins we don’t know in the middle. As it’s only 4 PM and we have time we get into a sort of art store in the ruins which seems to be related with cats: there are a lot of them around, but also are a lot of items with cats thematic for sale. We purchase just a calendar with a nice picture of a cat in a highlight of this city for every month. We follow Via dei Plebiscito until being in front of the Monument to Victor Emmanuel II. From here we can see the Colosseum far away, at the end of Via dei Fori Imperiali. We go to there as it is the way we must follow to Colosseo metro station. It is at the end, but at the beginning we still have Trajan’s Column, looking beautiful between the domes of St. Mary of Loreto and SS. Name of Mary. In the way, this wide avenue is full of statues of Julius Caesar and Augustus, as guarding the secrets of the ruins excavated at both sides of the street. The sun is leaving at the same time than us, about 5 PM, to our trip to the hotel.